Description: Wood − Paint − Wrought Iron Rectangular signboard with gilt edge around black frame enclosing a military equestrian an figure, perhaps intended to represent Gen. Andrew Jackson. Military officer wears chapeau−de−bras, a uniform coat with two spaulettes and a gilt braided plastron. He wears white pantaloons and spurs, holds a sword in his right hand and is astride a pra[il]ing white horse. 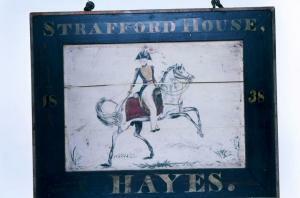 Across top of sign, in gilt letters, "STRAFFORD HOUSE". Across bottom, the name "C. Hayes" and the date 1838 appears on the two vertical borders. Screw or nail holes above and below the tavern keeper's name attest to a name change at some later date. The reverse side is compositionally similar except that the illustration is that of two deer, once drinking from a stream, and the other, the antlered male, standing beside a copse of trees.